This is the flower of the World. Around the corner, more bursts of color, more floating planes. "Are you looking for the speaker?" 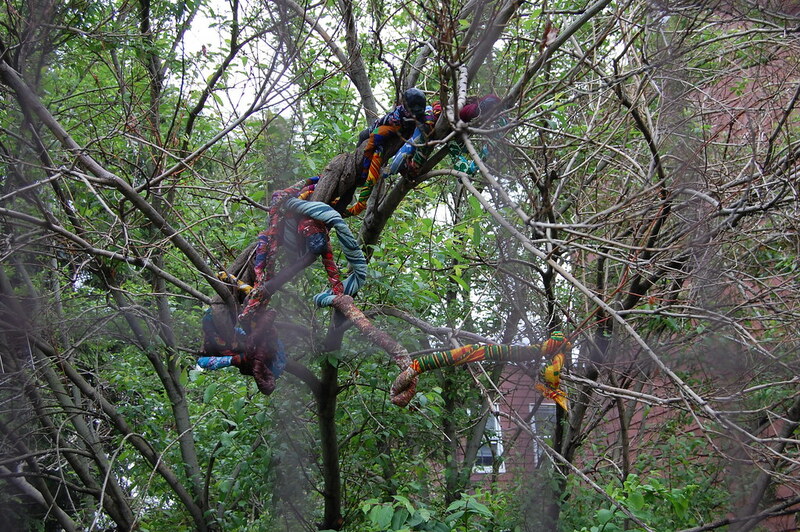 a middle–aged man asked me as he walked into the Powers Street Garden in East Williamsburg, Brooklyn, on May 15. I certainly was looking for the speaker. I had been standing at the entrance to the garden for four or five minutes, helplessly trying to find the Uri Aran audio piece that a map I had picked up at the nearby International Studio and Curatorial Program (ISCP) building promised was playing in the area. "It's right over there," the man said, with a kind but amused smile, pointing to the corner of the park, just a few feet away. "It goes on occasionally. Just wait for a minute." He paused to listen. "There it is now." A dispassionate man's voice was emerging from that leafy patch of the garden, filled with low trees and green bushes. "The mongoose, the hen, the cow," he said, naming a long series of animals. "Head lice, rats, mice, cockroaches." There were two lists, one of "good animals," the other of "bad animals," the pamphlet with the map explained, a guide to Turkish-German curator Necmi Sönmez's exhibition "In Back of the Real," titled for the eponymous Ginsberg poem, which brought the work of nine artists to the ISCP building and the streets that surround it. "The neighborhood is characterized by an enigmatic relationship between its manual laborers and artist community, with an 'invisible border' between economic production and the artistic imaginary," Sönmez writes in the pamphlet. To put it more simply, it is a neighborhood in the process of gentrifying, where automobile repair shops and community gardens sit alongside hip new bars and, as Sönmez notes, a former factory that has been converted to house studios for an international cast of artists. Like the Art Production Fund's current "Murals on the Bowery" project, Sönmez's show feels like an inevitable step in the very transformation that it seeks to address. Tanja Roscic, Rosarium, 2011. 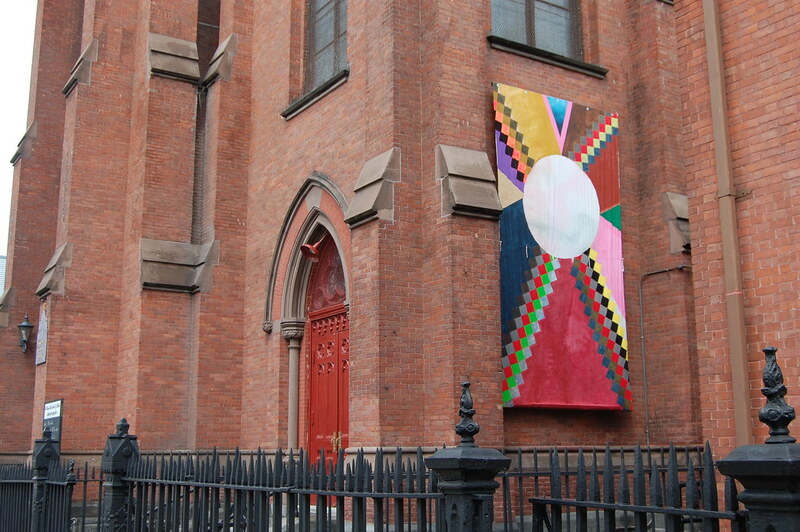 Textile sculpture, 14 x 7 1/2 ft., on Saint Nicholas Roman Catholic Church, on Olive Street, between Powers and Devoe Streets. Sönmez's transformation was fleeting. The exhibition was on view for only three days, March 13 through 15, and most of the works carried a light touch. 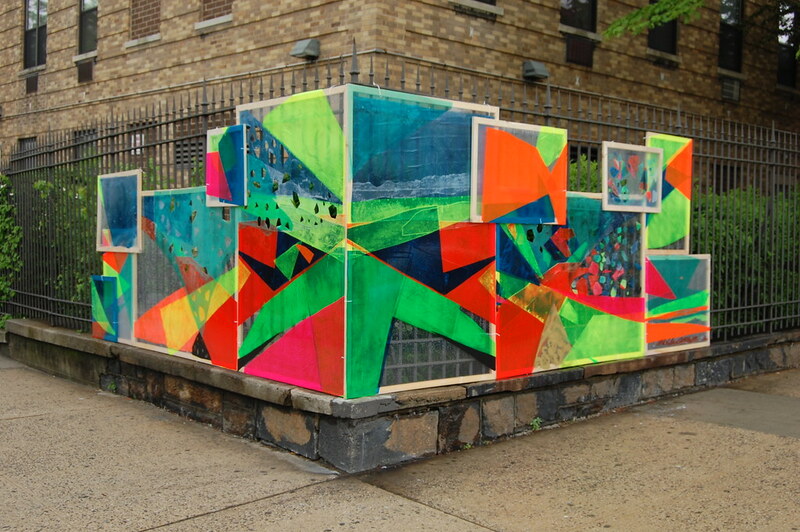 Some were very thrilling temporary additions, like Carolyn Salas' Second Sight installation — translucent vinyl rectangles that she painted with angular planes of color and hung along a fence at the corner of Bushwick Avenue and Powers Street. The panels oozed with strong–willed joy, even underneath Sunday afternoon's grey sky, even dappled with dewy moisture left by the morning's rain. Tanja Roscic's fourteen-foot-tall Rosarium was similarly majestic, hanging with restrained glory on the side of Olive Street's Saint Nicholas Roman Catholic Church. 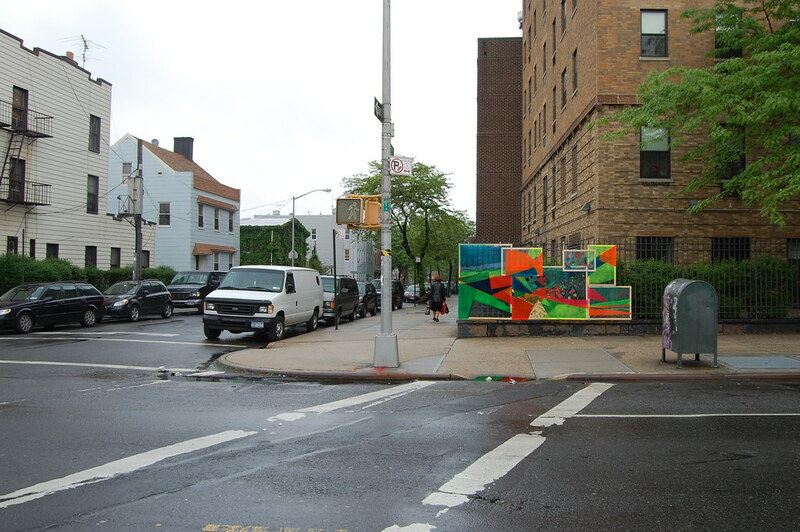 If I lived in the neighborhood, I wouldn't mind seeing those two pieces every day. A painting of Jesus that was not part of the exhibition. 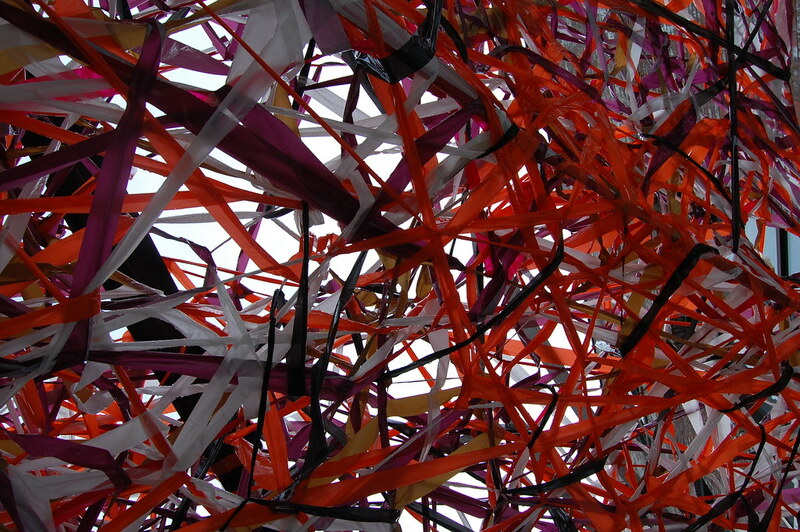 Luisa Rabbia, Emergence, 2011. 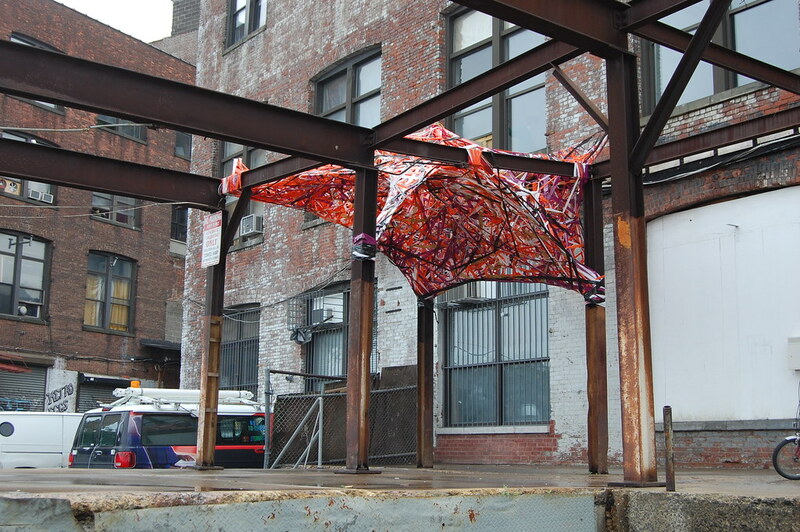 Textile and porcelain, dimensions variable, in the Olive Street Garden, corner of Olive and Powers Streets. A locked gate meant that viewers could only see the work by peeking through the surrounding metal fence. An intricate mosaic, also not part of "In Back of the Real." Katie Holten, Nature, 2011. Paint on metal, 22 x 60 in. 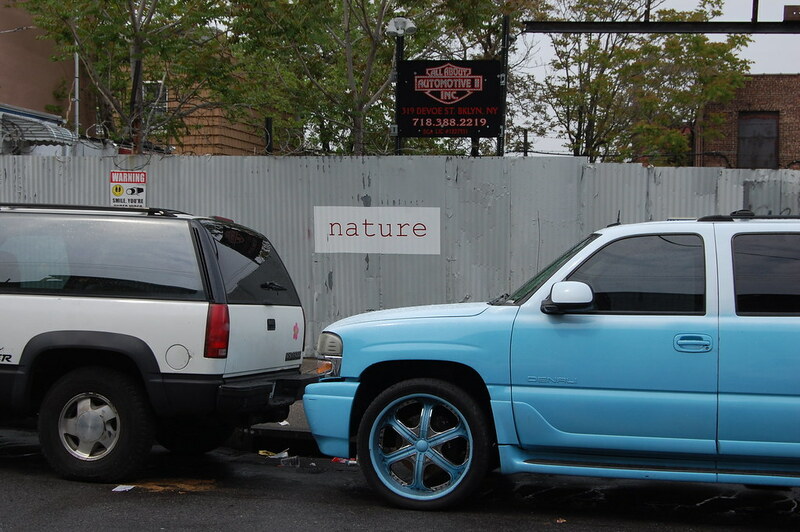 on All About Automotive, 319 Devote Street. Ana Santos, Untitled, 2011. Thirteen painted MDF boards, 30 x 50 in. each, on ISCP Building, along Morgan Avenue. 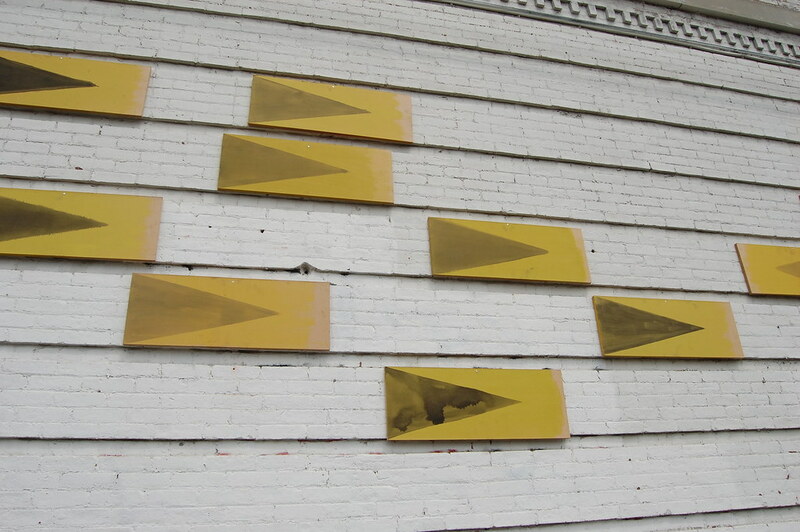 Thirteen yellow boards hovered mysteriously on a wall of the ISCP building, each adorned with a black triangle that seemed to be slowly fading away. They could have been mistaken for now-indecipherable signs of some forgotten industrial project. 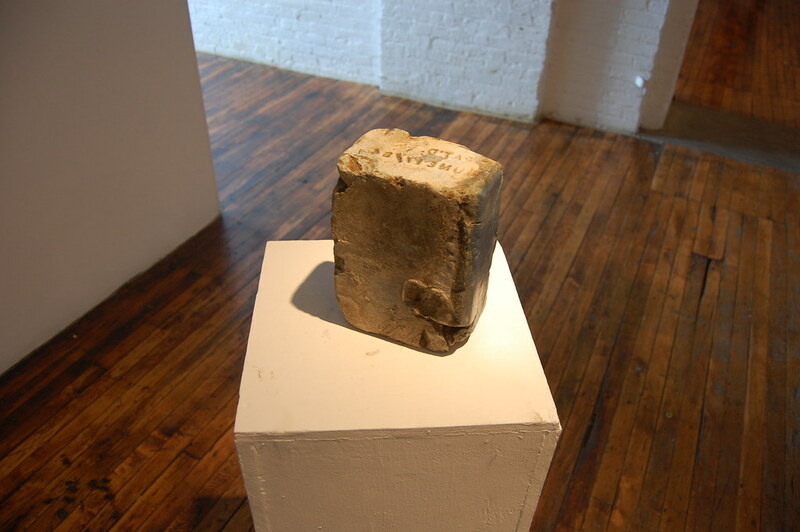 Reed Seifer (whom 2010 Armory Show visitors may recall as the artist hawking $25 bottles of an an elixir called Spray to Forget) addressed the industrial site even more directly, plucking a stone from ISCP's courtyard and installing it inside its gallery, where the show continued. Seifer filled in the empty space in the courtyard with Herkimer diamonds — also known as double-terminated quartz crystals — that were free for the taking. 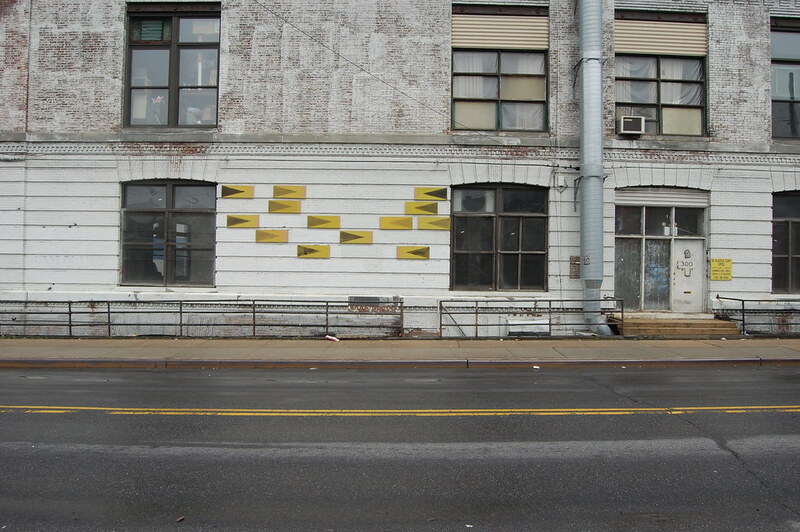 Faded geometric abstractions — Ellsworth Kellys or Blinky Palermos or naval flags — disappearing in the rain. Gereon Krebber, Out of Site, Out of Mind, 2011. Color tape, 30 feet long, at the ISCP loading dock. 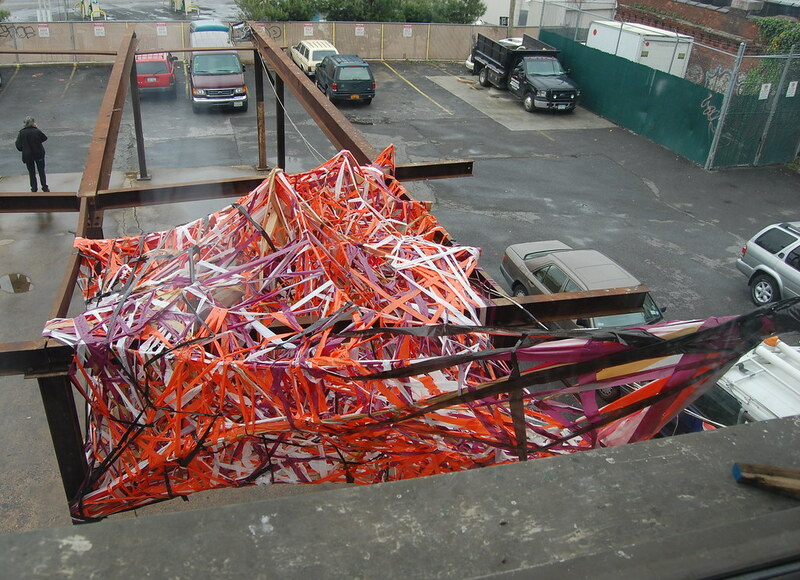 The mass of tape from above, viewed from the building's second-floor gallery. Reed Seifer, Neither Didactic nor Pedantic, 2011. Cobblestone and Herkimer diamonds, dimensions variable, in the ISCP Gallery and courtyard. Sönmez writes that these cobblestones may have served as ballast for ships as they journeyed to the New World in the 1600s, before being converted into material for the courtyard. According to an English inscription printed on some of them ("PAT'D JUNE 17 / 84"), the stones may have been in use in one form or another in the 1680s, when control of the community moved from the Dutch to the English — an earlier and even more radical transformation of the area than the one now underway.